We illustrate the spiritual and sociological reasons that led us to state in the MOSCHINO the ideal boat for many of us. Now let's see the characteristics of what we present: it is inspired by the traditional rowing boats I remembered from the beautiful Ligurian summers of my childhood, at between the ’50s and ’60s. Since you were swimming to the rocks (we had this sense of superiority to those who did at the beach) I do not think I’ve ever step on one of these boats, but sometimes some of the nearby beach were close to our reefs and roamed, languid and curious, in front of them. For my part, even then I was curious of this boat which conveyed a delicious sense of calm and serenity. 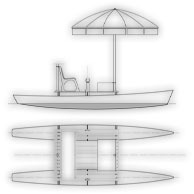 Without technical documentation on these boats, this is designed from memory, and I am sure it changed some details: for example, the bottom was flat and not V. As the umbrella, I don't really remember if there was, perhaps those scientists didn't yet explained that the sun hurts. The principal difference between the original boat and ours is that the first was essentially static, while mine is medium-dynamic. A reason for this choice is for practical nature: in those days it was enough leaving a few hundred meters from the beach to find a quiet and isolated place. Nowadays, at less than a mile from a beach town is hard to find any refuge from the crowds and noise. Our MOSCHINO must be able to move easily on rowing (for this reason the V bottom and stretch lines of the hulls) but also have to be able to move under sail. From an aerodynamic point of view there is no reason for it that does not work at all and some lift can be generated on beach umbrellas. Efficiency is not the best but anyway we're at sea, on a MOSCHINO where we boarded everything we need, maybe we are also in good company: what’s the hurry to get back to earth?